I just took a road trip up and down the highways of West Virginia, and I didn’t mind paying the toll because the autumn color was fantastic . As the trip progressed and the sun descended, the colors got deeper and richer, and the leaves glowed like they were lit up from the inside. A landscape that compelling made me want to keep on looking; stopping to blink was sacrilege. But I had to stop looking. There were signs that warned me to pay attention to the road: “falling rock”, “steep down-grade”, “strong cross-winds”, and “run-away truck lane ahead”. Yikes! So, I paid attention to the interstate, but I kept thinking about the populations of bright leaves. They reminded me of people clustered in communities. Some were oak people; some were scarlet maple people, some were pine people, and so on. 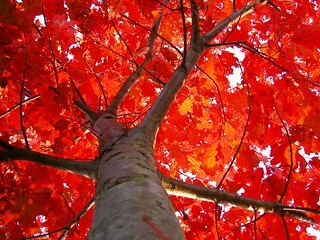 I reflected glumly, that I would probably be a brown leaf, instead of what I really wanted to be – brilliant red. Even as an imaginary leaf person, I was disappointed with myself, until I thought about it for a few more miles, and realized I had forgotten to factor “time” into my calculations. Time changes the appearance of foliage. New leaves emerge in the spring, tiny and yellow- green. By the time summer comes, the leaves are darker, bursting with light-catching pigment. But chlorophyll production grinds to a halt when days get shorter in the fall, and with the green pigment gone, the glorious hidden colors are revealed. At the end of the cycle, a barrier forms between the leaf stem and the tree. The winter leaf releases its hold on the branch, drifts downward on chilly winds, and crackles beneath my feet. A leaf has its sunny days, its fall festival, its winter dance- and no more. Like all organic things, it ends in dust. Leaves die. We die. Why is the prospect of dying (except for the rational fear of suffering) so distressing to us that we deny it, ignore it as long as we can, or spin fanciful “maybes” about it? I have a theory about this. I don’t think it’s because we’re afraid of non-being- unconsciousness isn’t unpleasant. I think what we really fear is being thrust, conscious, into the unknown. I think we know- deep down- that we don’t end. John doesn’t give us the details we crave, but he tells us something important. We don’t reach our final destination until we see Jesus. And we won’t be complete until we are in His presence. In the “fifth” season, my hidden colors will finally be revealed, but it will no longer matter to me. I’ll be looking at Him. You could never be a brown leaf person. You are amazing and your thoughts are often profound. Awesome thoughts, Deb! You, my friend, were born to be a red dancing leaf, and I know in heaven we won’t care–but it will be fun to see what kind of leaf people we are. I’m counting on our trees being close together! Great profound thoughts. You’re right, of course. It’s not the unconscious we fear but the frightening aspect of a place we don’t know and have no hope to enter apart from Him.